A couple of weeks ago, I was shocked to discover my book, Nightmares of Caitlin Lockyer, on the Top 100 Bestseller List with Dean Koontz and Stephen King. For it to happen once to just one of my books was wonderful. 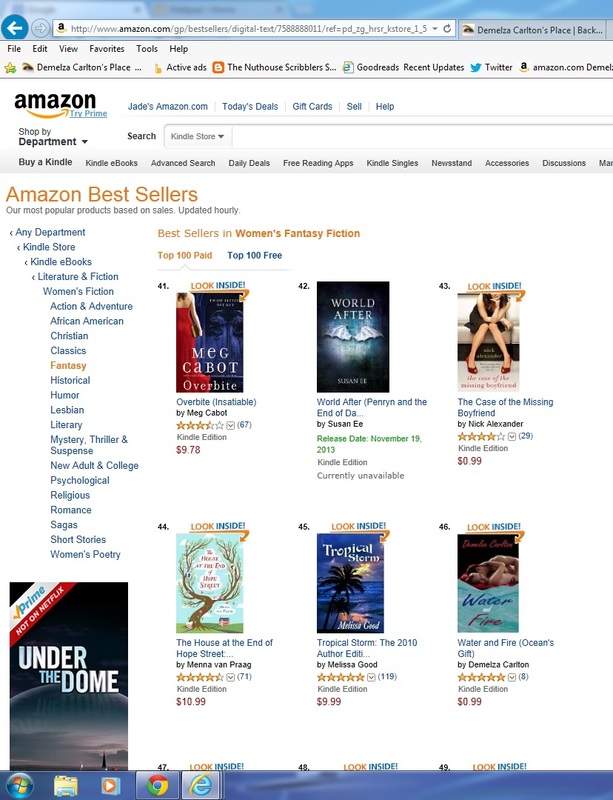 Yet, within a week, two other books hit their categories’ respective Top 100 Bestseller Lists, too. First was Water and Fire, which hit TWO lists – for Medical Fiction and Women’s Fantasy Fiction. My little hospital romance sat beside books by Meg Cabot and Marian Keyes. It stayed there for over a week, from early Saturday morning through to this morning – longer than Nightmares stayed in the Top 100 Bestseller List – and, to the best of my knowledge, it’s still there. 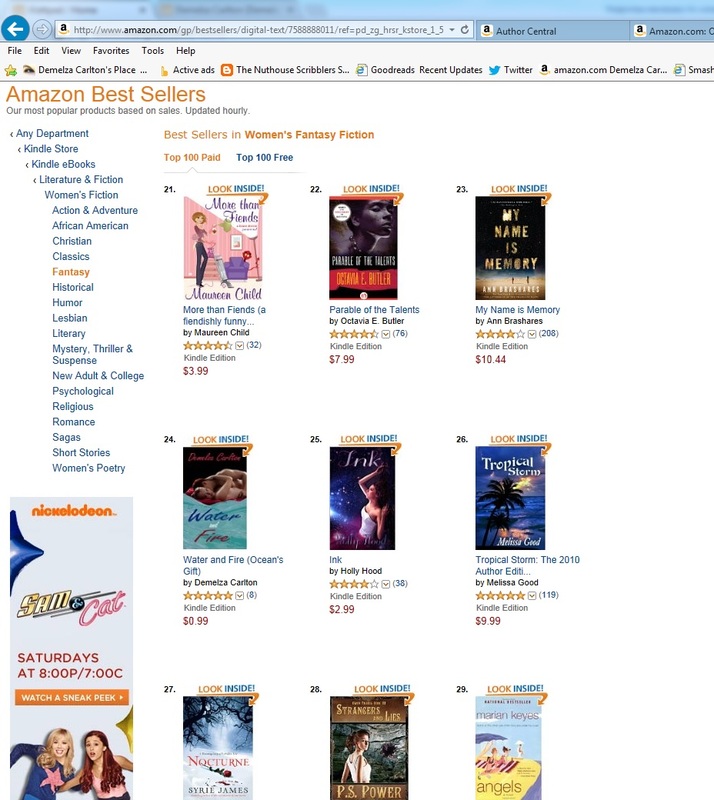 To make my weekend almost perfect, Ocean’s Gift also made a Top 100 Bestseller List on Sunday, for Australian Travel Fiction. That made a trifecta for me – three books on three different Bestseller Lists within a single week. More than this little Aussie author ever thought to expect. Firstly, I’d say luck. I was lucky enough to write books people wanted to buy at around the same time and gain their notice amid millions of other books. Secondly, I’d say promotion. Paid promotion and non-paid promotion. The lovely book blog reviewers who have kindly agreed to review and promote my books (if you’re after lists and links, check out my Out and About page), putting in the time and effort to not only read my books but write a coherent and honest review on what they feel are the most important points of my book. Add this to paid promotion, where I pay to place an ad on the sidebar or header of other people’s websites and blogs, hoping that my cover and short advertising copy is enough to entice someone to lift (or click on) the cover to inspect the goods. Thirdly, I must say product presentation. Having a good book with an enticing cover and intriguing blurb, carefully edited and formatted to make sure the reader’s experience is the best it can be. I spend days perfecting my book descriptions and change them as appropriate. I spend even longer on the books themselves – weeks and months writing and then editing them, but that’s just the beginning. Formatting and graphic design are incredibly important, bridging the gap between a manuscript and a book. I ask for feedback from people, too – friends, family and fans. I value honest feedback on all of my work and if you like or hate one of my book covers – or anything about my books, really – I’d prefer you told me. Admittedly, if you tell me you hate mermaids because they can’t possibly exist and consequently you hate my Ocean’s Gift series, so be it…but I won’t stop writing them as a result. I’d just recommend that you avoid them. After all, imaginary creatures that don’t exist should be easy to avoid. Fourth (I won’t say last, because it’s not as if this is the least important point, simply the one I have the least control over) is the number of kind reviews that make it onto Amazon and Goodreads from the people who buy and enjoy my books. I always felt strange writing a review of a product online where everyone could see it because I honestly didn’t think anyone cared about my opinion – until I realised that people do care about it. They want to know other people’s opinions, both good and bad, before they buy things. Books, vacuum cleaners, restaurant meals…your opinion matters. I’ve been very lucky that so many of you have been kind enough to review my work after you’ve read the book. So…thank you. Through a combination of work, your help and a lot of luck, my books are going places I never thought possible. Next week, who knows? Love your Blog and your sense of humour! It’s kind of hard to keep the sense of humour out of it…it’s so much a part of my books that it spills over into most of my writing. Congratulations! I was privileged to read and review Ocean’s Gift and I am so excited it’s doing well! !